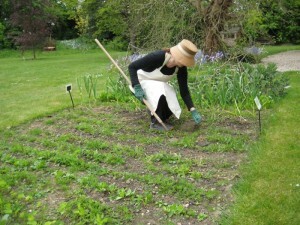 The weather conditions on 09/09/2010 at Ella Montt’s Plot in MERL’s garden were favourable for early September, neither too hot nor too cold; there was a mixture of sun and clouds in the sky. 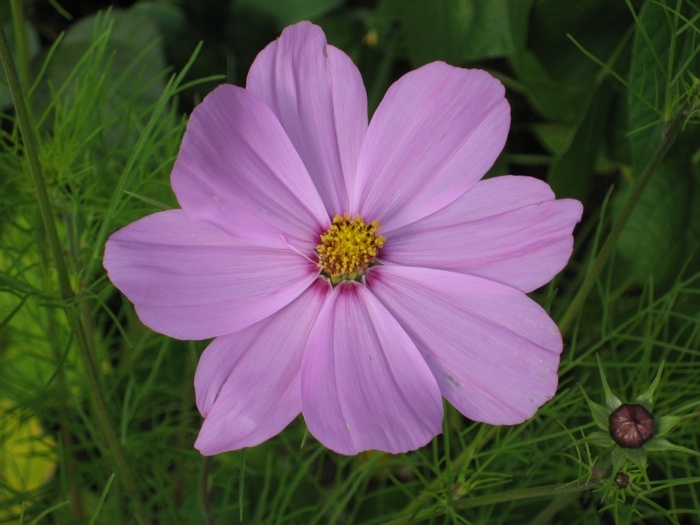 Both white and pink Cosmos Cosmea were flowering. Ella Montt wonders if the structures of the Cosmos flowers are universally judged to be beautiful or if it is herself that critiques these flowers in such a way? The Pepper plant’s life energy is fading. It is up rooted from the Plot. In contrast the Aubergine plant appears healthy, but still bearing no fruit. 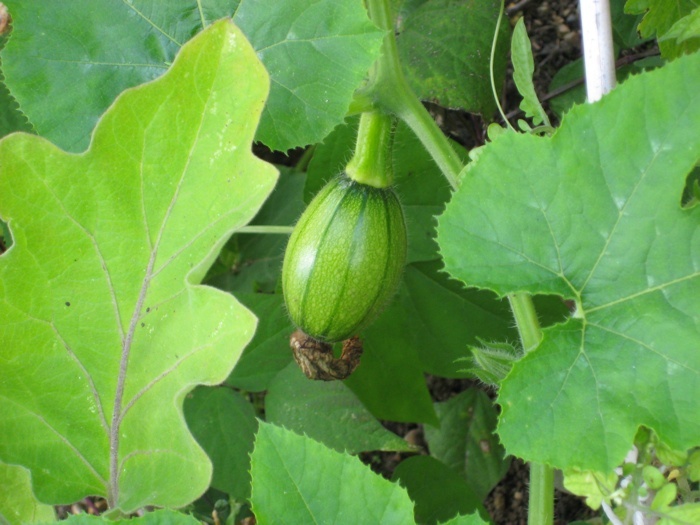 A few of the Squash plants are fruiting but too late in the growing season for substantial growth, they will need water and sunshine to accelerate their plumping. The days harvesting commenced: Courgette Soleil F1 = 2oz = 40grams; 3 Dwarf Beans Royalty = 1oz = 20g; Rainbow Chard = 1.5oz = 30g; Kale Pentland Brig = 3oz = 60g; Kale Red Russian Curled = 1oz = 20g; Tomatoes = 1lb4oz = 600g; Cucumber = 2oz = 40g; French Climbing Beans Blue Lake = 1lb4oz = 600g and Blauhide 1.5oz = 30g; Runner Beans = 7oz = 200g. This entry was posted in Aesthetic, Allotments, Artwork, Harvest, Plot and tagged Aesthetic, Art, Harvest, Plot on September 19, 2010 by katecorder. 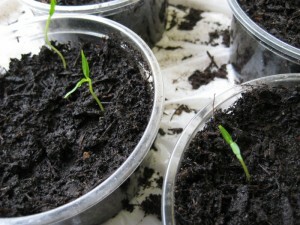 Planting Performance (4) occurred on 13/05/2010. The weather conditions were warm and sunny. For several days prior to the Planting event, it had looked like it may rain, the previous evening dark storm clouds had gathered, but no rain fell. 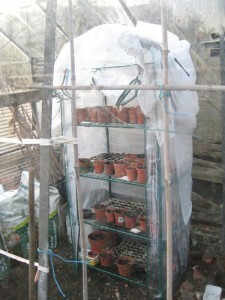 Temperatures were dipping down at night causing frost damage to some plants, but luckily not on the Allotment Plot. 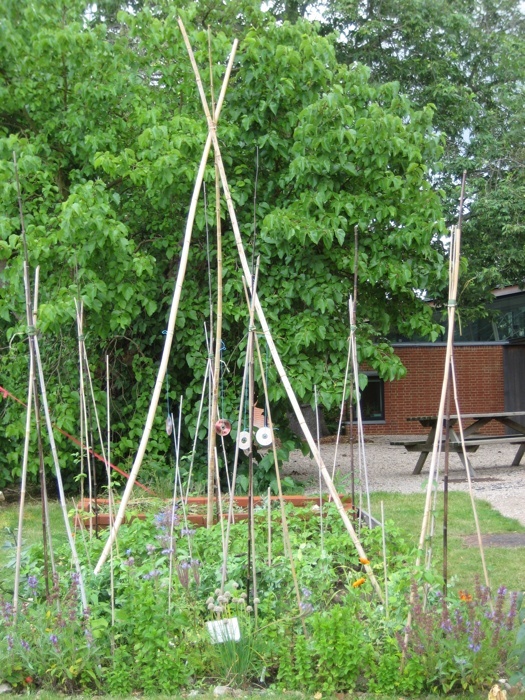 The state of the Plot reports as follows; the Broadbeans had almost finished flowering, the dying flowers that have turned black, will form their bean pods over the next few weeks. 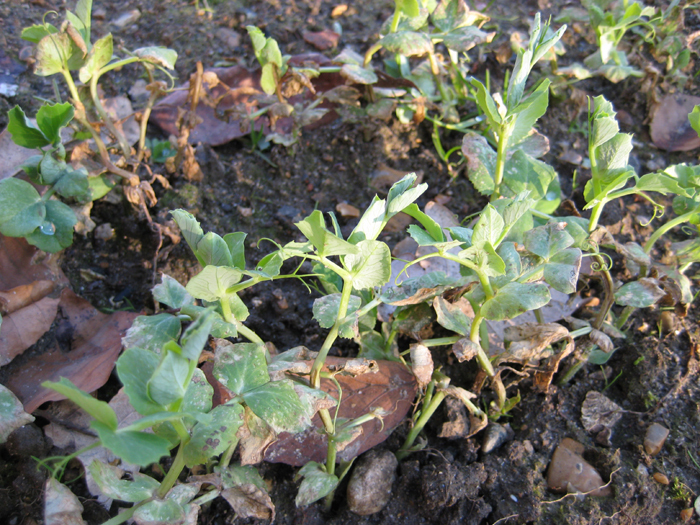 The Peas, now very much recovered from the cold winter, are flowering so the first Pea pods will arrive soon. 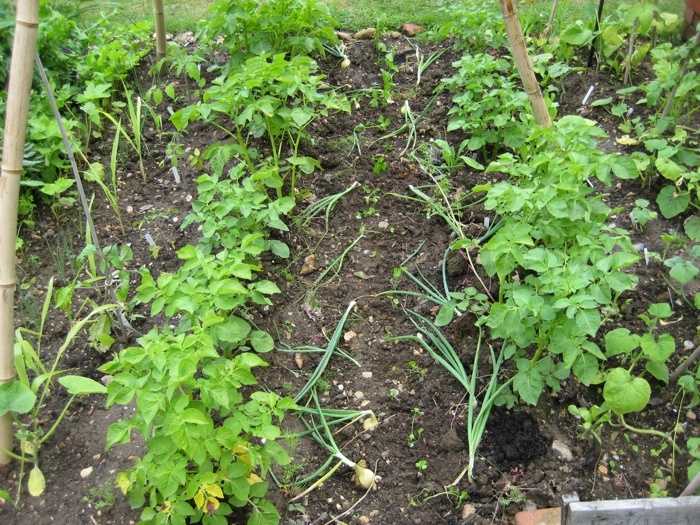 The garlic continues to grow as does the onion sets, although the Garlic has always seemed to be growing far more rapidly than the Onions. The over wintered Spinach that was supposed to provide food through out the winter, is now going to seed and the leaves are still small. 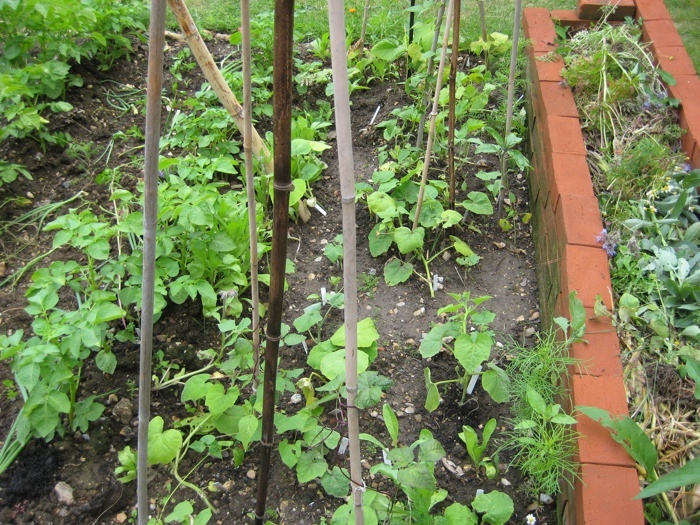 The Brassicas have been attacked and eaten by predators, possibly pigeons, leaving the skeletal frames of the seedlings. 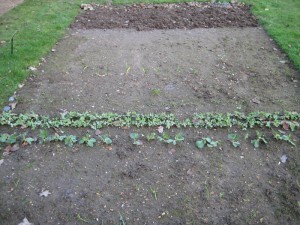 Will the Brassicas recover or are they doomed to crop failure? Is this high or low drama on the Plot? What may seem comparatively insignificant in the scheme of the Plot, could in months to come, when the greens are most needed for nutritional requirements, mean that there is a substantial deficit in food production, producing a hungry gap that should not be there at that time. 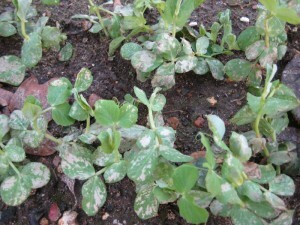 Covering the Brassicas may assist in their recovery, but it may not, because the damage could be too great. The situation will be carefully monitored. 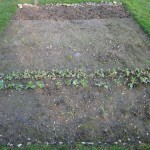 Planted at the Plot on that day in honour of Guerrilla Gardeners everywhere was a sunflower seeding and sunflower seeds. Weeding then prevailed. 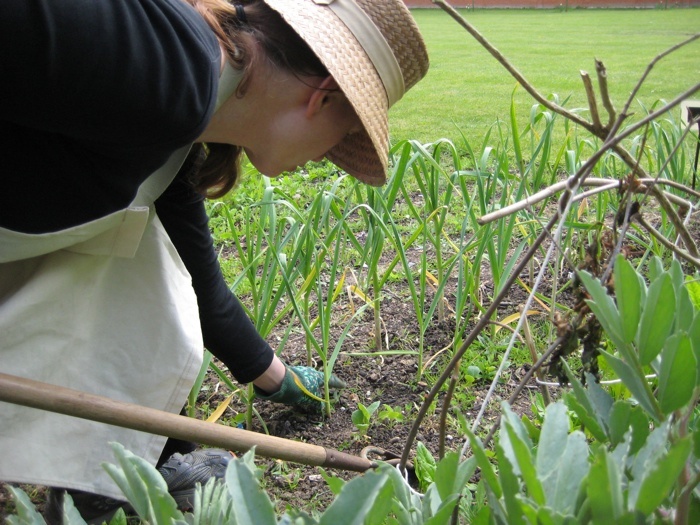 Using a hoe and also by hand many weeds were removed from the plot. Weeding will be an on going activity on the Plot. Is the viewer aware that this Allotment Plot is a live Art situation? It is an on going event that can be visited in Museum opening times. The Plot is growing its own aesthetic. Ella Montt will not always be there, but the Allotment Plot is. 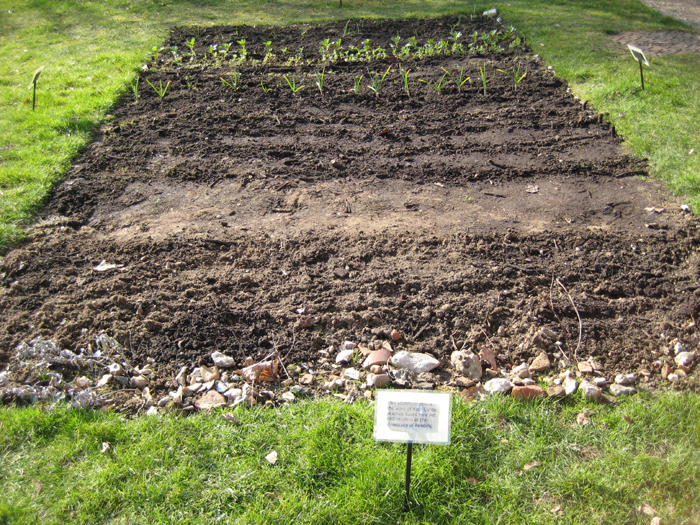 Does this particular Plot differ from the two other vegetable plots in the garden and what makes it Art? 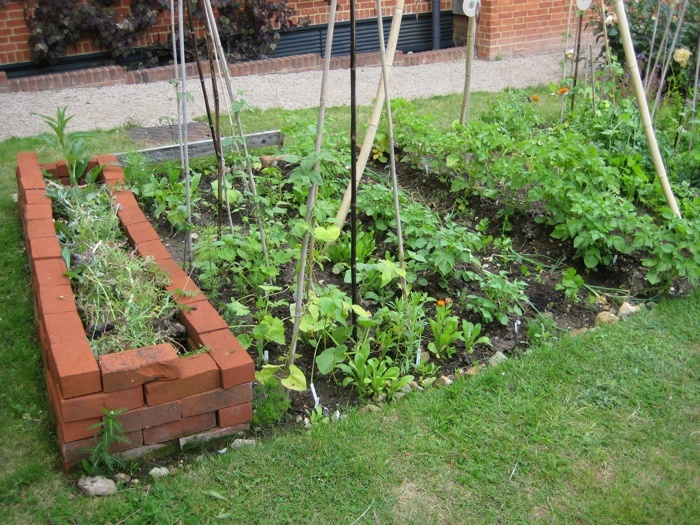 This entry was posted in Aesthetic, Allotments, Artwork, Event, guerrilla gardening, Planting and tagged Aesthetic, Allotments, Art, Growing, guerrilla gardening, Planting on May 25, 2010 by katecorder. Ella Montt journeyed East from London to a specific Place, (for now an undisclosed location). 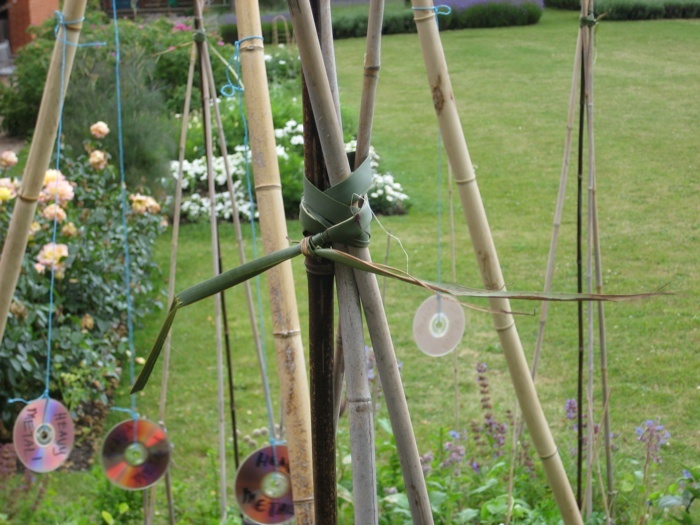 Fields were traversed, conversations and images recorded as part of the Ella Montt’s methodology. The tree, the fields, what history they hold hidden in their memory. The Place contained an Event that went on as a process extended over time spanning growing seasons and years. The Event became an Influence that would reach into the Future. 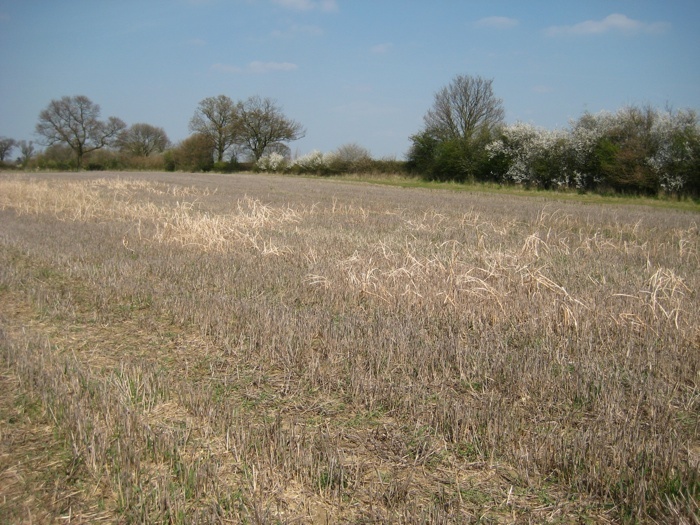 Wild blossom of a Blackthorn winter surrounded the stubble fields that were left to rest fallow for a year. 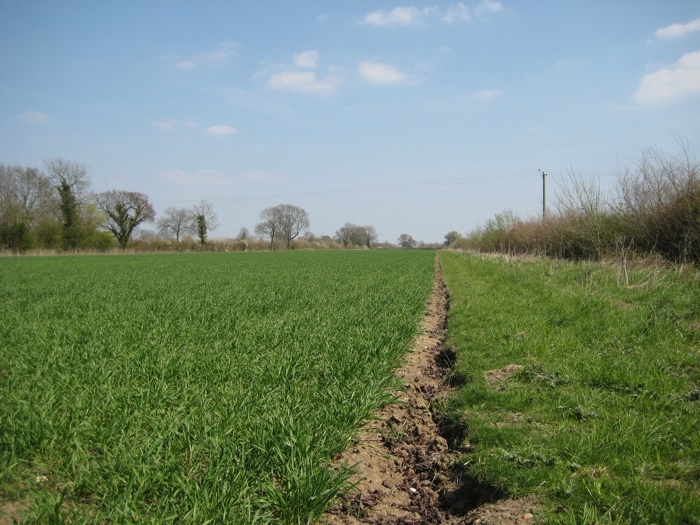 The other fields planted with wheat were greening over under the heat of the sun. 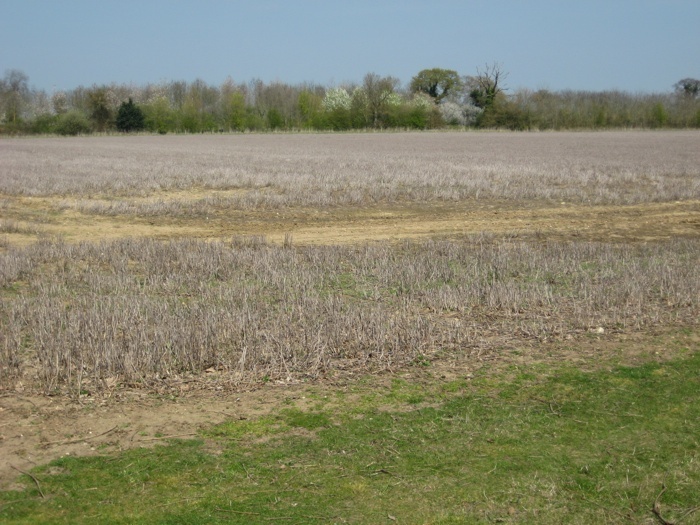 The significance of the fields and their history may be unconsciously felt by many, as tangible but without knowledge of their origination. 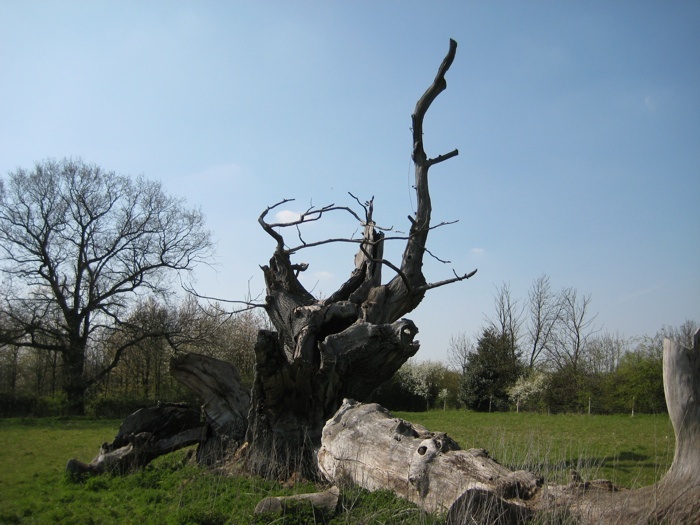 The Tree, an ancient oak, reported to be 900 years or so old, has collapsed to the ground. 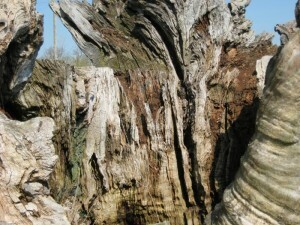 The Tree has witnessed many happenings and is highly important as part of the Place. The Place is a Monument to labour specific human activity. This entry was posted in Artwork, Event, Place and tagged Aesthetic, Place on May 3, 2010 by katecorder. 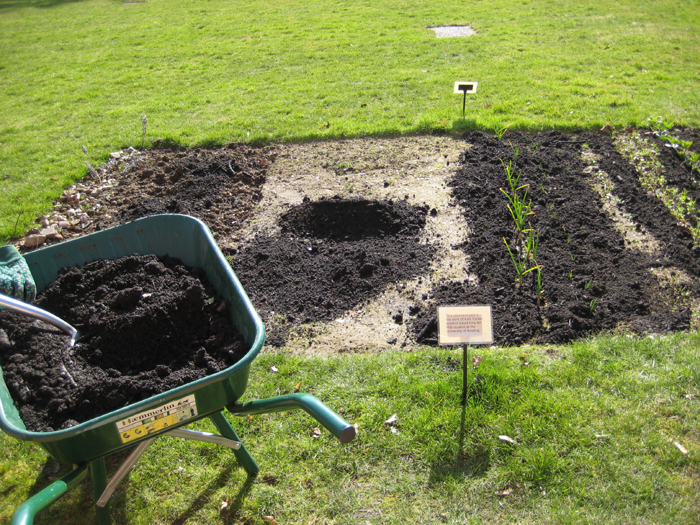 Planting Performance at MERL happened on 5 March 2010 11am-1pm. Weather conditions for the Planting were good; frost overnight, sun bright and warm, slight breeze, last rainfall a few days before, specifics for planting were appropriate. Grounds men had recently deposited a large pile of compost that was available for usage. 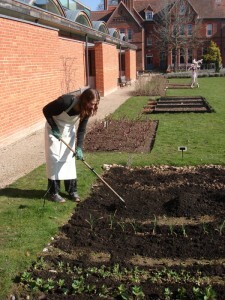 The compost was derived from recycled green waste at the University. Some of the compost was shoveled into three wheelbarrow loads and delivered to the Allotment Plot, then shoveled out and spread with the use of an historic rake. The rake was purchased at a car boot sale four years ago and handed to the artist, (who is now known as the subject Ella Montt). Seed planting began including conversation. Ella Montt as a subject is not a gardener, but Ella Montt as an artist is performing planting and gardening. 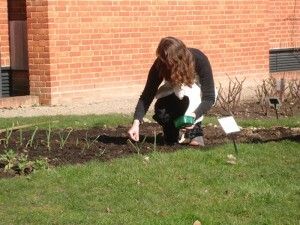 Ella Montt is planting performance within the arena of MERL, the museum’s garden. 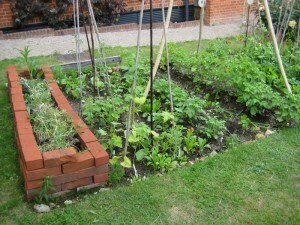 The Allotment Plot is a performance area. Performance and growing is Ella Montt’s medium, for Ella Montt this is the same as painting or sculpture. Ella Montt’s intention is to encourage critical debate with persons that may come into direct or indirect contact with Ella Montt. The aesthetic surrounds ethics and political motivation or material. 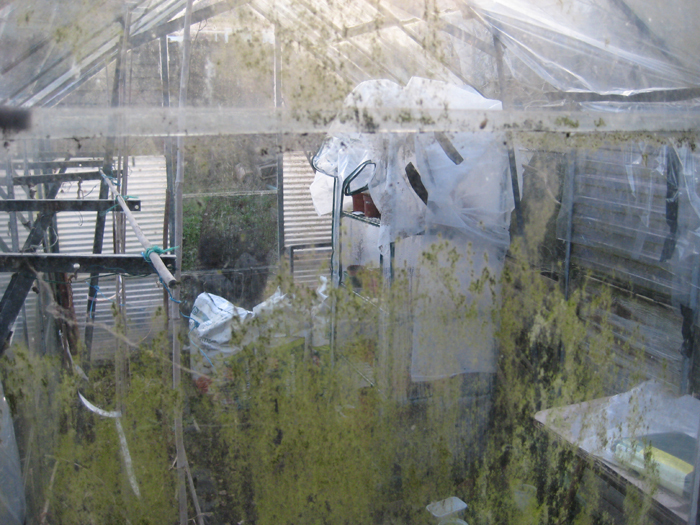 The viewer may or may not wonder what other impulses are hidden within or behind the Allotment Plot. 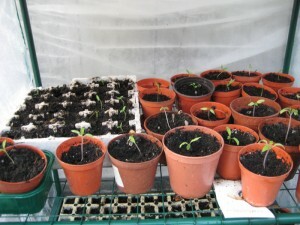 Organic vegetable seeds planted were as follows: 2 rows of Brussels Sprouts Darkmar 21, 1 row of Cauliflower Snowball, 2 rows of Parsnip Halblange White, 1 row of Carrots Amsterdam Forcing, 1 row of Kale Pentland Brig. 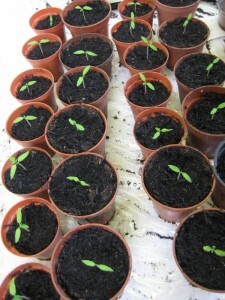 Other organic herb and flower seeds were also planted; Dill, Coriander Santos, Flat Leaved Parsley, Borage, Nasturium, Pot Marigold Calendula Officinalis and Cosmos Cosmea. What seeds germinate and what will survive to grow to maturity is a hidden mystery, unpredictable from the start. Harvest is the intention. Weather acts as an agent. Wild life that is present in the garden can harvest at will unless blocked by human interference. Biodiversity acts out its role as assistant in promotion and deterrent in the organic state, with no need for chemical warfare. This entry was posted in Aesthetic, Allotments, Artwork, Performance, Planting and tagged Aesthetic, Allotments, Organic, Performance, Planting, Plot, Seeds on March 7, 2010 by katecorder. The studio location was also moved, further down the corridor to a different space. A blank white wall appeared in order to negotiate art practice. 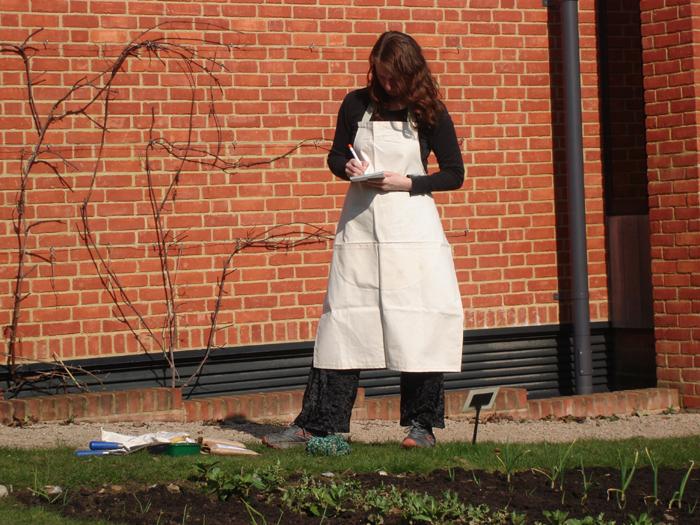 What is the relationship of art practice in the studio to seedlings growing as art practice in The Fixed-Up Greenhouse, the Allotment Plot at MERL and the research for art practice? Theory, fact and fiction may surround the groundwork. This entry was posted in Aesthetic, Allotments, Artwork, Place, Studio and tagged Aesthetic, Art, Seedlings, Studio on March 2, 2010 by katecorder. 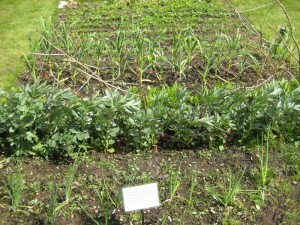 The Allotment Plot’s specificity is plant life growing at a Place which contains the Plot. The Place and its multiplicity is fold and refolded. The plant life’s roots and radicles are growing around the groundwork of the Plot. The Art Practice is wrapped with roots that radiate and shoot. All plant life being in its specificity not entirely rhizomatic. “A rhizome as subterranean stem is absolutely different from roots and radicles. Bulbs and tubers are rhizomes. Plants with roots or radicles may be rhizomorphic in other respects altogether: the question is whether plant life in its specificity is not entirely rhizomatic.” (Deleuze & Guattari – A Thousand Plateaus). This entry was posted in Aesthetic, Allotments, Artwork, Growing and tagged Aesthetic, Allotments, Growing, Seedlings on February 25, 2010 by katecorder. After a week when the allotment plot at MERL was covered in snow, the vegetable plants are still surviving, but some are suffering frost and snow damage. 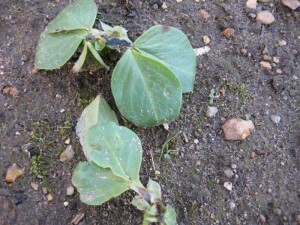 It would seem frost burn is the condition, a few of the Broadbeans are slightly effected, as is the Garlic and the Peas more so, but there are no outright casualties. 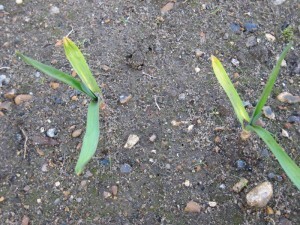 The Sprint Garlic is growing (sprinting), much more quickly than the Thermidrome Garlic, which is only just appearing out of the soil. The Onion sets growths are very slow. Can the aesthetic condition of a vegetable reflect the state of the world through political consensus? Or is the political to blind to see the aesthetic? This entry was posted in Aesthetic, Allotments, Artwork, Gardening, Political and tagged Aesthetic, Allotments, Art, Growing, MERL on January 21, 2010 by katecorder.